Samsung is preparing to release a new Flash memory-assisted computer hard drive that boasts improved performance, reduced energy consumption, a faster boot time, and better reliability. The new hybrid hard drive will be released around the same time as the upcoming Windows Vista operating system and will be one of the first hardware designed specifically to benefit from it. In mid-May 2006, Samsung unveiled a prototype hybrid hard drive (HHD) at WinHEC, the Windows Hardware Engineering Conference. Samsung’s prototype HHDs have a buffer of 128 or 256 MB, much larger than the 8-16 MB of cache in current hard drives. This new buffer differs from the existing cache buffer on hard drives not only in size but also in structure, composition, and qualities. Conventional cache is made out of volatile memory that is erased when the drive is powered down. HHDs add another layer of cache consisting of Flash memory that is non-volatile and can be accessed quickly when the drive is powered on. Adding a large buffer to a hard drive can also reduce the drive’s power consumption, thereby increasing the battery life, and reducing the time required for the system to resume its operation after suspension. Indeed, boot or resume time will occur about twice as fast as conventional hard disk drives, saving 8-25 seconds, and laptop batteries will provide 20 – 30 minutes more power. Another added bonus of the HHD is the improved reliability due to less mechanical wear and tear. Samsung and other manufacturers are currently pursuing Solid State Drive (SSD) technology (covered on our “Samsung’s Solid State Disk Drive Unveiled” article). Currently Flash prices are too high to allow SSDs to replace standard hard drives of any reasonable size and, although Flash prices are continually falling, it will be several years until such a drive will become affordable to most users. Here enters the near-term solution for enjoying improved performance at a reasonable price – the hybrid hard drive, combining the low cost and large storage capacity of conventional hard drive technology with quick and low-power Flash memory. Apart from the reduction in Flash memory prices, hard drive manufacturers such as Samsung believe that we are about to undergo a major storage revolution in the next few years due to the upcoming release of Windows Vista. This new operating system from Microsoft will introduce three new performance-enhancing technologies: SuperFetch, ReadyBoost, and ReadyDrive. According to Microsoft, “SuperFetch understands which applications you use most, and preloads these applications into memory, so your system is more responsive”. Windows ReadyBoost allows users to use a removable Flash memory device such as a USB thumb drive to improve system performance. ReadyBoost retrieves data stored on the Flash memory more quickly than data stored on the hard disk, decreasing the interval until the PC responds. Windows ReadyDrive enables Vista-based PCs equipped with an HHD to boot up faster, resume from hibernate in less time, preserve battery power, and improve hard disk reliability. 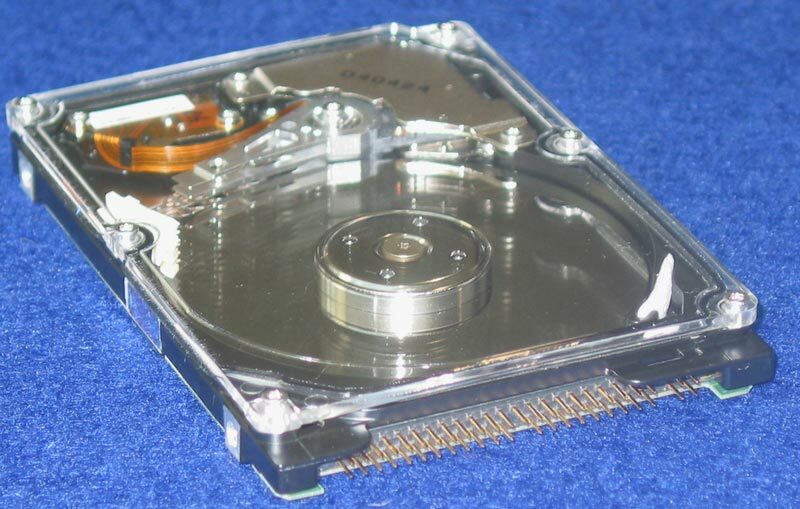 Hard disk platters are components of hard disk drives that consist of circular rigid disks that store magnetic data. While the platters in conventional hard drives rotate most of the time, thereby consuming a great deal of power, the platters in HHDs are usually at rest, as if they were off. In HHDs, incoming data is generally written to the Flash buffer and any saved documents are saved to the buffer, instead of being written to the hard drive each time. Only when the Flash buffer is almost full or when the user accesses a new file that is not stored on the buffer, will the HHD platter rotate or “spin up”. Thus, the battery power of laptops with HHDs is preserved, extending battery life. To learn more about Samsung’s hybrid hard drive technology, TFOT interviewed Andy Yang, the Strategic Marketing Manager of Samsung’s Memory Division. 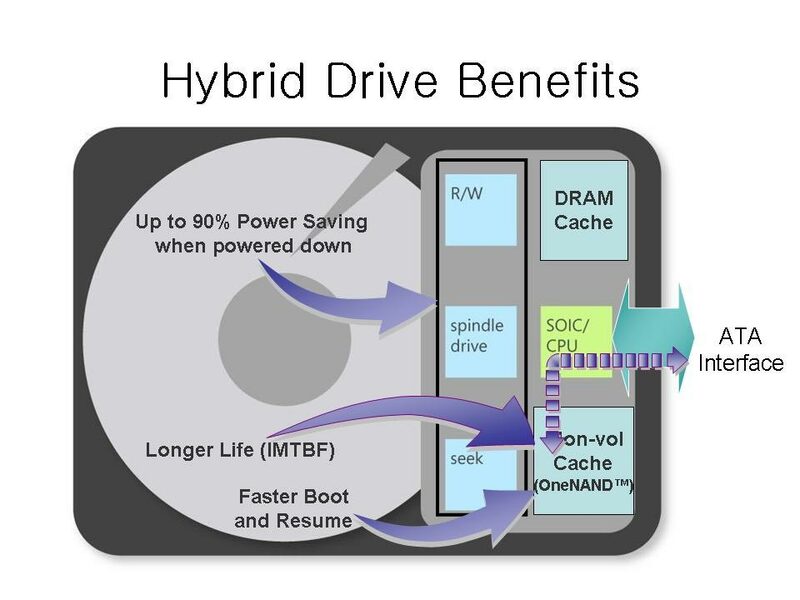 Q: How does the HHD use Flash memory in order to improve performance? A: Flash improves the speed, power consumption, and reliability of the hard drive. In terms of speed, the real performance gain is the result of very high performance random access. For example, booting is very seek-intensive, so with much of the boot time, the processor has low utilization because it’s waiting for data from the rotating disk. With Flash, there are no mechanical latencies for random data retrievals, hence a significant performance gain. Because the drive is one of the most vulnerable parts of the system to mechanical trauma, overall system reliability may be improved by up to five-times by keeping the spindle spun down and the heads parked. Q: Your new HDD includes 128 MB or 256 MB of Flash. How does the amount of Flash memory affect the performance of the HHD and will 1 GB of Flash HDD perform better than the exiting models? A: The amount of Flash will influence how much read and write cache is available. In the write case, a larger buffer allows more data to be stored in Flash before it needs to be flushed to the magnetic media. The optimal size for write cache is still to be determined since it’s dependent on many variables such as usage patterns and amount of DRAM (dynamic random access memory). On the read side, the amount of Flash effects how much data can be stored for read acceleration. In addition to accelerating boot time, if a PC OEM wanted to load certain applications into the Flash to achieve a near “instant on” experience, then this code can also be “pinned” into the Flash. The HHD can also be used as a ReadyBoost device, where the Flash can be used as a read cache. Q: Samsung’s HHD uses OneNAND Flash with 18 MB/s write capability, which is still much slower than current desktop hard drives. Do you see this as a problem? A: Sequential write performance should not be a significant issue. If there is a large file, then the HHD controller should write the file to rotating media. Keep in mind that all the data does NOT need to pass through Flash. It is ideally used to store somewhat frequent, but small size writes. If somebody is copying a huge video file to the disk, it should be streamed directly to rotating media. It’s also noteworthy that although some rotating HDs have good sequential write performance, they are still significantly slower for small random writes. 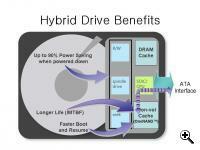 Q: Would you explain how your HHD works with Microsoft’s ReadyDrive technology? A: Windows ReadyDrive enables Windows Vista PCs equipped with a hybrid hard disk to boot up faster, resume from hibernate in less time, preserve battery power, and improve hard disk reliability. The hybrid disk is intended for mobile PCs running Windows Vista. Data is written to a 128 or 256 MB Flash memory cache inside the HHD, which greatly reduces the time that the mechanical hard disk needs to be spinning – saving considerable battery power. The hybrid disk helps Windows Vista resume faster from a sleep state because data can be restored from Flash memory cache faster than from the mechanical hard disk. 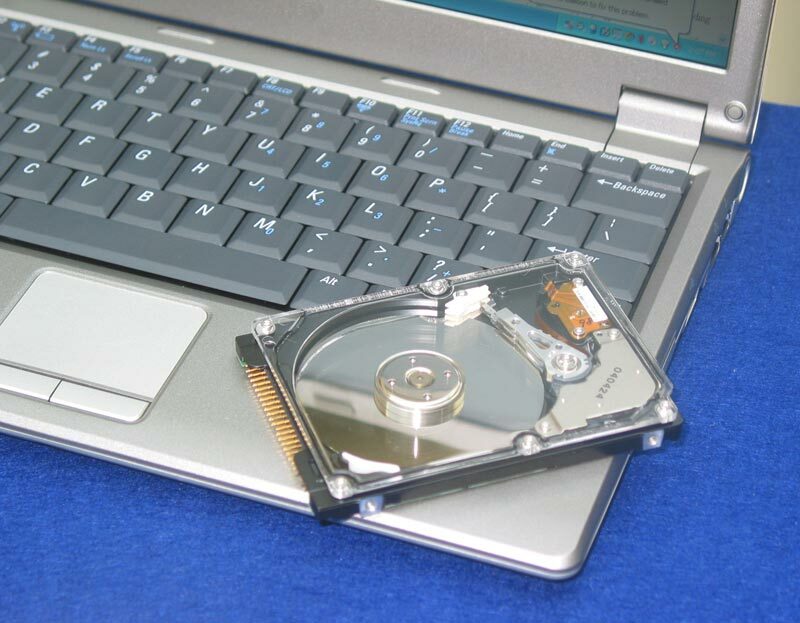 Since more data is written to the integrated Flash memory than to the traditional hard disk, users have much less risk of problems with the hard disk when they’re on the move. Q: Will Windows XP users be able to enjoy the new drives or will it work only on Vista? A: HHDs are designed to work only with Vista. Q: Are you going to launch 3.5 inch (desktop) versions of the HHD right away or will you concentrate on the portable/laptop market initially? A: We’ll concentrate on the notebook/laptop versions initially. Q: Should we expect HHDs to price competitively with conventional hard drives of the same size upon their release? A: Yes, they will price competitively but likely with a very slight premium.